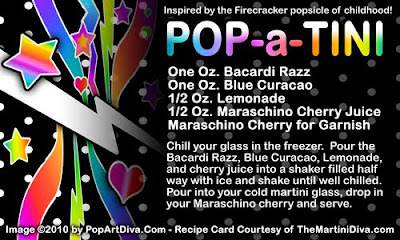 The POP-A-TINI is a raspberry, lemon and cherry martini inspired by Popsicle's Firecracker® popsicles. The flavor profile of this martini is based on those same raspberry, cherry and lemon flavors. For the fun blue color of the raspberry part of the popsicle I've used Blue Curacao which adds just a touch of orange/citrus. The popularity of Blue Bunny's Bomb Pop® (Bomb Pop Martini link below!) inspired a bunch of red, white and blue popsicles with similar flavor profiles but the two most popular were the Bomb Pop and the Firecracker®. Bomb Pop used lime where the Firecracker used lemon. I always found it interesting that growing up in the "atomic age" we had so many explosive icre cream and candy treats! Read more about nuclear noshes on Ice Cream Nostalgia and The Cold War.